Young people obviously love videogames, so we at the Center for Educational Technologies® wanted to know how we could best use the games to introduce important science concepts through them. The Selene videogame, which is part of our CyGaMEs project, is attempting to answer that. Selene, named after the Greek lunar goddess, is an online game created by Center for Educational Technologies to study how youth learn through educational videogames. 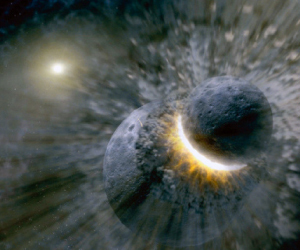 In Selene players learn the major geologic processes scientists believe formed the modern Moon by creating their own moon and then peppering it with impact craters and flooding it with lava. After initial funding from NASA and now continued funding from the National Science Foundation, we are using Selene to conduct research into the effectiveness of videogames as learning tools. The study is ongoing so youth are encouraged to join the research by playing the game. To play, students must be enrolled by an adult recruiter to ensure a player's age. The game is designed for youth ages 9 and up. The game takes about an hour to play, but gamers can spend more time cruising through Selene's various resources about the Moon. It's a great opportunity for students to learn about lunar geology while helping researchers study some key videogame design principles. Check out the Selene website to become a recruiter or learn more about playing the game. One of 15 international finalists in the Disney Research 2010 Learning Challenge Competition. The 15 finalists have created engaging learning widgets that best harness the potential of digital technologies and children's creativity to advance learning. The finalists delight, inspire, and reveal key learning concepts for children ages 7-11. 2008 Outstanding Practice for Design and Development of Selene: A Lunar Construction GaME. Awarded by the 2008 Outstanding Practice Committee of the Design and Development Division of the Association for Educational Communications and Technology to "those individuals or groups that have designed exemplary instructional materials or systems." Semifinalist in the category of interactive media in the 2007 International Science and Engineering Visualization Challenge sponsored by the National Science Foundation and the journal, Science. Named one of the most talked about games at the 2007 Game Developers Conference. Awarded a spot in the Design and Development Showcase at the 2007 Association for Educational Communications and Technology annual conference.